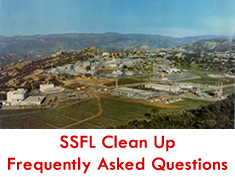 The Santa Susana Field Laboratory (SSFL) was the site of ten atomic reactors and tens of thousands of rocket tests. Several of the reactors suffered accidents, including a partial meltdown, which along with decades of spills and other releases of radioactive and chemically toxic materials led to widespread contamination. In December 2012, EPA released results of a several year study that identified 500 locations at the site contaminated with strontium-90, cesium-137, plutonium, and other radioactive materials. In 2007, concerned about lack of effective cleanup, the California Legislature passed and Governor Schwarzenegger signed into law SB990, which required remediation of the contamination to the most protective EPA standards. Boeing, which has strenuously resisted cleanup, sued California to overturn the statute. The core of its case was an assertion that radioactive cleanup was federally pre-empted. However, in 2010, DOE and NASA signed enforceable agreements to clean up their portions of the site to background, i.e. removing all contamination that can be detected. DOE agreed to clean up all of Area IV, where the nuclear work occurred. NASA owns all of Area II and part of Area I, where rocket testing was conducted. Those agreements, which are independent of SB990, were unaffected by the court’s ruling. The contamination in the remaining parts of SSFL, Area III and Boeing’s part of Area I, is chemical and subject to the state’s longstanding hazardous materials laws that pre-date SB990 and are not affected by the court ruling either. Under those laws, the state can require the cleanup to the strictest standards. Indeed, cleanup is required to be to the land use specified by local authorities in zoning and general plans. For SSFL, that is agricultural/rural residential use. Boeing claims it wishes to clean up to a far lesser standard, what it purports to be suburban residential. But its “suburban residential standard” is 150 times more lax than EPA’s suburban residential cleanup goal, and would result in leaving the great majority of the contamination not cleaned up. It would prevent 98% of the hundreds of locations where EPA found radioactive contamination from being cleaned up. The same is true for chemical contamination. One deeply troubling aspect of the case was the conduct of the Brown Administration. Under Governor Schwarzenegger, the state vigorously defended the law. Boeing hired as advocates former aides of Jerry Brown from when he was Governor before. Within a month of Jerry Brown being sworn in as Governor in 2010, the state signed a stipulation with Boeing agreeing to not contest virtually any purported fact that Boeing might subsequently assert in prosecuting its case. This blind, carte blanche waiver of the right to dispute erroneous asserted facts was made prior to even seeing the facts Boeing eventually did assert, many of which were clearly false or misleading. However, the state had given up the right to dispute them, no matter how false, and the appeal court relied heavily on the fact that the state did not dispute any of Boeing’s assertions. But the Brown Administration didn’t dispute them because it had quietly given up the right to do so, without publicly disclosing its astonishing deal with Boeing. Note: the Rocketdyne Cleanup Coalition, Southern California Federation of Scientists, the Committee to Bridge the Gap, and Physicians for Social Responsibility-Los Angeles submitted amicus briefs in the Boeing case.